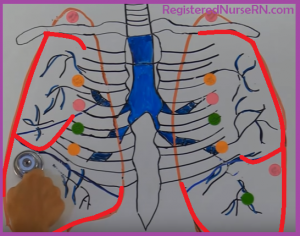 Learn lung auscultation points and normal breath sounds vs abnormal breath sounds. This article will highlight everything you need to know about assessing a patient’s lung sounds. As a nursing student or nurse, it is important you know how to correctly assess a patient during a head-to-toe assessment. Listening to lung sounds are a vital part of this assessment. In the previous review, I covered how to assess heart sounds. So, after you read this article be sure to watch the video and read the highlights on how to perform this assessment skill as well. 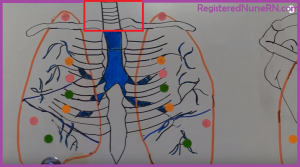 Don’t forget to take the lung sounds quiz which will test you on lung auscultation landmarks and audio sounds. Ask yourself is there anything “weird” heard along with the inspiration and expiration. For example, are you hearing crackles or wheezes? Have the patient sitting up with arms resting on lap. When listening to the posterior side of the chest the arms need to definitely be in the lap so the scapulae are separated. Have patient breathe in and out through mouth slowly while listening. Allow the patient to set the pace to prevent hyperventilating , especially patients with breathing disorders like COPD. 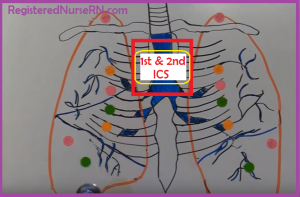 At the 4th intercostal space you will be assessing the right middle lobe and the left upper lobe. Then midaxillary at the 6th intercostal space you will be assessing the right and left lower lobes. Note: within these landmarks move your stethoscope around to assess other areas as well. Again, move your stethoscope around to assess various areas while comparing sides. What are Normal Breath Sounds? What are Abnormal Lung Sounds? These are extra sounds heard LESS than 0.2 seconds during a full respiration cycle. May be heard in patient with fluid overload, pneumonia etc. May be heard in patients with edema in the lungs or ARDS (acute respiratory distress syndrome). May be heard in patients with COPD or pneumonia etc. May be seen in children with conditions such as croup or epiglottitis or anyone with an airway obstruction etc.